This material is covers chapters 3 and 4 of Wernerfelt (2016). These chapters are, in turn, based on Wernerfelt (1997) and Wernerfelt (2015), respectively. Wernerfelt considers two questions to do with the firm that he thinks important but go largely unanswered in the standard theory of the firm literature: What determines the choice between the use of the market, a firm or a contract? Why are all of these mechanisms so commonly used? His answer to these questions is contained in the "Adaptation Cost" theory of the firm. Start with a situation where a worker is providing a particular service to an entrepreneur. The entrepreneur's needs change so that the worker's service would have to also change if he is to stay with that entrepreneur. But the worker's productivity will suffer if he, either, changes the service he provides or changes to another entrepreneur and in either of these cases costs would have to be incurred due to the process of bargaining over the terms of a new agreement. But the costs of worker adaptation are not just those of bargaining, there are also costs, in terms of lower productivity, if the worker has to change, either, to a new service or a new business. A worker is most efficient when he is "double specialised". That is, when he is continually providing the same service to the same business. If this "double specialisation" is not possible it is often second-best to specialise in one of the two dimensions and deal with occasional adaption in the other dimension. Some such adaptations, whether it be between two businesses or two services, are more costly than others. The basic theory of the Adaptation Cost theory was developed in two papers by Wernerfelt, Wernerfelt (1997, 2015). To begin with the 1997 paper (chapter 3 of Wernerfelt 2016). The focus is on workers who supply businesses with services. The problem is that the needs of the businesses change. Three mechanism to deal with the changing needs are considered: employment, sequential contracting and price lists. In chapter 3 adaptation costs are mainly price determination costs only, since production costs are held constant. Under the employment mechanism, workers and entrepreneurs negotiate on a once-and-for-all basis over the wage and a large set of services to be supplied on demand. This is similar to the situation in Simon (1951). Here a firm is made up of an entrepreneur and a number of workers who provide the entrepreneur with services via the employment mechanism while the scope of the firm is determined by set of workers thus employed by the entrepreneur. The downside of this is that since there are a large number of things to be bargained over the initial bargaining costs are large, but once agreement is reached there are no further costs incurred so the gains from trade are realised in each period. Under the sequential contracting mechanism a new price gets negotiated whenever the business's requirements change and thus bargaining costs are incurred on each such occasion. However as the bargains are simpler than those required for the employment contract - the parties are bargaining over a single, known service - the per-occasion bargaining costs are lower. With the price list, a set of price are agreed upon ex ante and then the list is referred to as needed. As with the case of sequential contracting the per-service bargaining costs are low but if the initial bargaining is over a very long list of prices those costs are high. Here the diversity of needs - how long the price list needs to be - is important to the relative attractiveness of the mechanism. 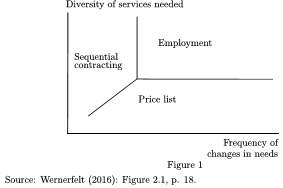 When the need for a change in service adaptation arise with sufficient frequency, the folk theorem allows us to assume that all trades are efficient under the employment and sequential contracting mechanisms, while under the price list mechanism all trades actually covered by the list are efficient. An implication of this is that there are no trading inefficiencies and thus the only bargaining costs involved are those associated with the mechanism process itself. Given this, the performance of each of the three mechanisms depends only on the costs of adapting to changes in the requirements of the businesses. In the employment mechanism, costs are a one-time thing related to the negotiation of the wage agreement; for the sequential contracting mechanism the costs are the per-occasion costs of agreeing a price for that particular event; while for the price list mechanism the costs are those one-time costs involved in negotiating the price list plus the loss in the gains from trade for any situations not covered by the list. Given that the employment mechanism has the lowest costs of adaption - just a verbal instruction - there exists a region in the parameter space, situations in which needs change frequently, in which the employment mechanism (weakly) dominates the other two mechanisms, see Figure 1. From Figure 1 it is clear that price lists are good when they can be kept short, i.e. there a small number of services needed, sequential bargaining is good when changes are infrequent and employment is good when needs change frequently and many diverse adaptations are required. Next consider the Wernerfelt (2015) paper (chapter 4 of Wernerfelt 2016). Importantly in this case adaptation costs are expanded to include the costs due to less efficient production. 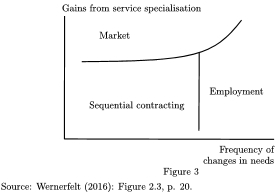 Specifically Wernerfelt assumes that there are gains from specialisation - where specialisation implies little in the way of adaptation - along two dimensions, first businesses and second, services. The former is modelled as an increase in adaptation costs for the worker each time he wants to service a different business. The latter is captured by assuming different workers are good at different things. In this situation three mechanisms are compared: employment, sequential contracting, as before, and markets. Again it is assumed that trade is ex post efficient in all three mechanisms. Wernerfelt concentrates on minimising adaptation costs. Under the employment mechanism performance is delineated by the gains from trade in each period minus the one-off costs of negotiating the employment contract. The performance of sequential contracting is the gains from trade minus the bargaining costs incurred each period. The important thing about the market mechanism is that it allows workers to specialise in the services at which they are most efficient. "For example, instead of being superintendents they can be plumbers, carpenters, or electricians" (Wernerfelt 2016: 19). The advantage of this is that the gains from trade are increased but the disadvantage is that workers incur business adaptation costs (lose gains from specialisation) every time they switch businesses. Wernerfelt shows that there are three regions in the parameter space in which each of the three mechanisms (weakly) dominates both of the two other mechanisms. The relative performance of each of the three mechanisms depends on the frequency with which the needs of the businesses change, the gains from specialisation in an particular service, the business adaptation costs and bargaining costs. See Figure 2 and Figure 3. Consider Figure 2. 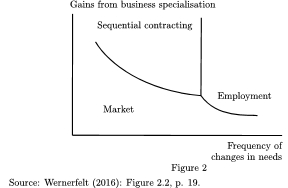 Markets are good when workers' between-business adaptation costs are low, that is, the gains from business specialisation are low and thus workers can cheaply switch between businesses; sequential contracting is good when changes in needs are infrequent; and employment is good when the cost advantage of service specialists are small and needs are changing quickly. Another parameter is shown in Figure 3. Here "service specialisation" - the gains from specialisation in a particular service - is considered. Markets are good when service specialists are a lot more efficient than an employee carrying out many different tasks. The owner [of the building] will typically have an employee, the superintendent, perform minor repairs (``the toilet leaks"). The building generates a steady flow of small problems, they tend to be urgent, and the superintendent can solve each of them pretty well. On the other hand, certain minor renovations, such as those having to do with electricity (``install LED light bulbs in public spaces"), are normally done through the market. The jobs are often larger, service specialists can do them better, and the building does not need a full-time electrician. Major renovations, for which advance planning reduces the need for in-process changes, are typically governed by a bilateral contract subject to occasional, though typically costly, renegotiations. The same example can illustrate the effects of size. A landlord who owns just one or two units will typically go to the market even for minor repairs because these units do not generate enough work to support a superintendent. On the other hand, very large landlords, such as universities, typically use specialist employees (their ``own" electricians) for both repairs and minor renovations. The major prediction of this theory is that the more frequent are changes in needs the more attractive the employment contract becomes. Simon, Herbert A. (1951). "A Formal Theory of the Employment Relationship", Econometrica, 9(3) July: 293–305. Wernerfelt, Birger (1997). "On the Nature and Scope of the Firm", Journal of Business, 70(4): 489-514. Wernerfelt, Birger (2015). "The Comparative Advantages of Firms, Markets, and Contracts", Economica, 82 no. 236: 350-67. Wernerfelt, Birger (2016). Adaptation, Specialization, and Theory of the Firm: Foundations of the Resource-Based View, Cambridge: Cambridge University Press.